The US Mint has been very active the last two weeks announcing new coins and collectibles. Colorado is the latest state to be honored in the 50 States Quarters program with formal ceremonies being head Denver, the Colorado capital. Yesterday began the Buffalo 24-karat Gold Coin program with a striking ceremony at the West Point branch mint. But somewhat lost in the fanfare was the unveiling of the design for the 2007 Jamestown 400th Anniversary Commemorative. Jamestown was founded in 1607 by members of the Virginia Company who were sent across the Atlantic Ocean on three ships to make a profit from the natural resources found in the New World. From 1607 through 1698, Jamestown was the capital of the Virginia colony and the primary gateway for shipping goods back to England and other areas of the world. Today, archeologists are excavating the original settlement as part of the Jamestown Rediscovery project. Their findings will be part of the overall 400th anniversary celebration. To commemorate this anniversary, Public Law 108-289 [GPO: text/PDF] authorizes the minting of 100,000 $5 coins made from 90-percent gold that weighs no more than 8.359 grams and 500,000 $1 coins made from 90-percent silver that weighs no more than 26.73 grams. 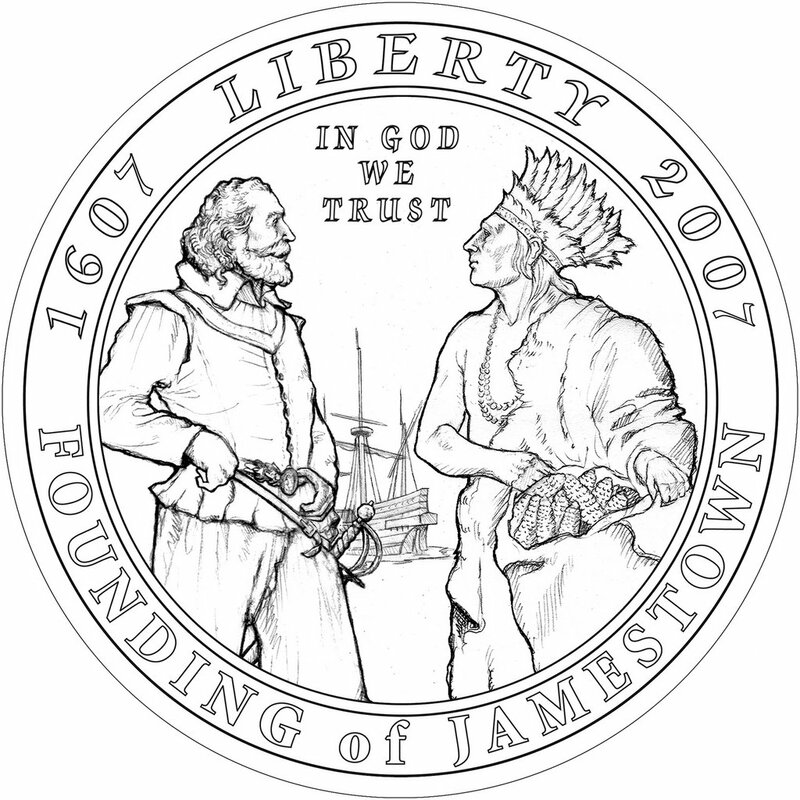 Surcharges from the coin will be given to the Jamestown-Yorktown Foundation. The Mint unveiled the designs to the public on June 16, 2006. Line art images of the coins are from the US Mint Image Library. Mint Sculptor-Engraver John Mercanti designed the obverse of the $5 gold coin depicting Captain John Smith conversing with an American Indian. 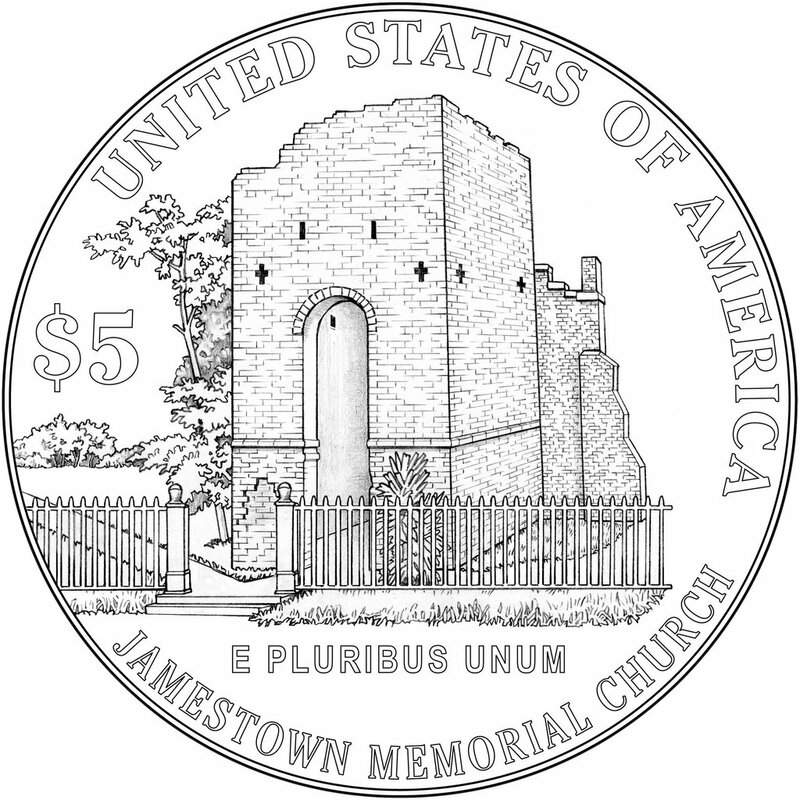 The reverse of the gold coin shows the Jamestown Memorial Church, the only structure remaining from the original settlement. It was design by Artistic Infusion Program Master Designer Susan Gamble. 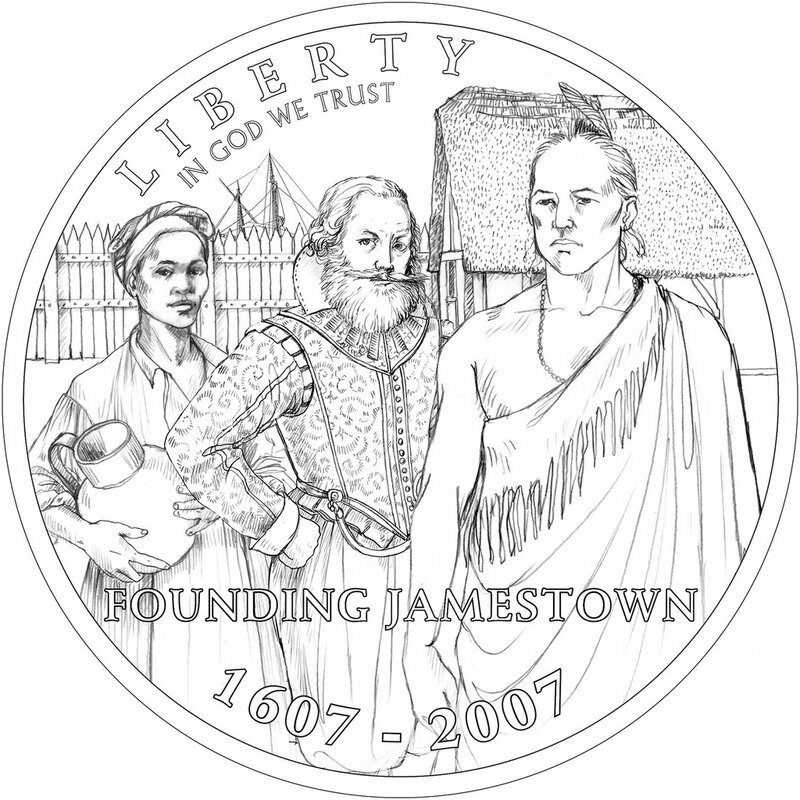 Donna Weaver, the recently retired Mint Sculptor-Engraver, design the obverse of the $1 silver coin to depict the “Three Faces of Diversity” to represent the three cultures that came together in Jamestown. 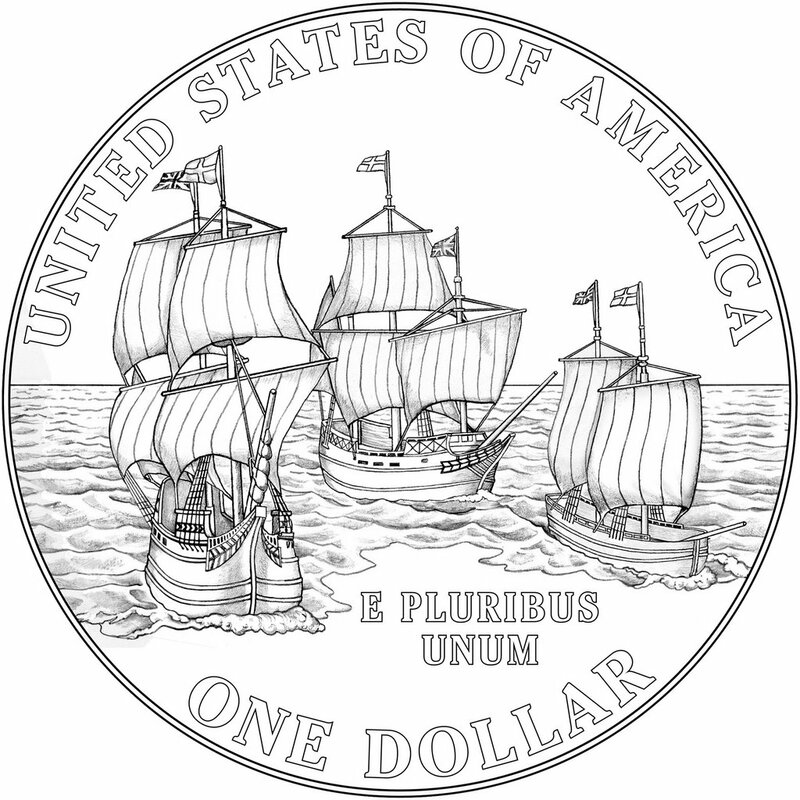 Susan Gamble designed the reverse of the silver coin to depict the three ships that carried the first settlers across the Atlantic Ocean: the Godspeed, the Susan Constant, and Discovery. Both appear to be very pretty coins in their line art form. The reverse of the coins by Susan Gamble from the Artistic Infusion Program look to be well executed and has the potential for great eye appeal in the yellow and white metals. This is going to make a nice collectable and confirm the success of the Artistic Infusion Program.